Gorgeous deep orange baby carrots are loaded with flavor. A favorite of gourmets, 2-3" 'Caracas' carrots are container-perfect. Carrot, Caracas Hybrid is rated 4.3 out of 5 by 8. Rated 5 out of 5 by ilovehummingbirds from So cute I can't remember when I planted these so am not sure when to harvest - I took these out as testers. How do I know when they are ready? Also I have planted them very close together. 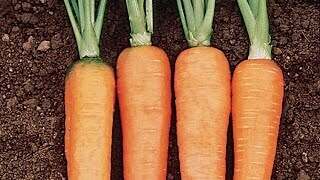 Rated 5 out of 5 by kallisti from Delicious and easy to grow I successfully grew a buttload of carrots in short window box planters. They were delicious and easy! I helped germination by spraying down the top of the soil every morning with a spray bottle. Rated 5 out of 5 by FarmerJules from SUCCESS!! We harvested CARROTS for Mother;s Day!! My first attempt at growing carrots EVER. We planted these baby (Caracas) carrots AND the bigger Touchon variety. We planted them beginning of March (Zone 9b) into above ground planters my husband built. I tossed the thought of using fertilizer around a bit but in the end chose not to. NEVER even hadt ONE pest so didnt have to use any poison/spray whatsoever. It was SOO rewarding to harvest as a family (invited my parents over for the pickin' party) Picked em. washed em up quickly, and chowed down. Healthy snacks directly from the garden. The taste was phenomenal. I read some people complaining about an earthy flavor but that was just NOT the case for me. They were crisp, and very SWEET. I had plans for cooking some up however, we only have 6 left....the entire lot was eaten raw in a day !!! I dropped my seed in one by one (so i wouldnt have to worry about thinning later) 30 of these Caracas baby seeds were planted and we ended up with 28 baby carrots. Id say thats a FANTASTIC germination rate!! Im pleased ALL THE WAY AROUND! Doing it again in the fall!! Rated 1 out of 5 by Josie54 from no luck The carrots are growing - the ferny things are on top so we will see - but I had no luck this spring/summer with growing carrots. That is why I am trying it again. Rated 4 out of 5 by rocky42 from Very good I will grow these again. Great for stew,pork and beef roast. Great to just eat. All around is worth having!! 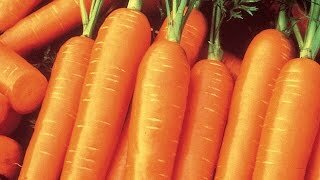 Rated 5 out of 5 by Periwinkle Épée from Love these carrots! I live in Southwest Florida and these babies have thrived and grown beautifully. Rated 5 out of 5 by BriDiesel from Nice First time growing carrots. Super easy. The barrel method is the way to go. Nice crunch and flavor raw. Rated 4 out of 5 by SStephens from So far so good Have yet to taste these little carrots - have another couple of weeks to go before harvesting my first batch. I planted in a deep half barrel, about 20 seeds, and I'd say 80% germinated. My carrot tops are now 10-12 inches high after 5 weeks and seem very healthy. Will update when I harvest, but hoping for sweet results! I have started another barrel and seeds have just sprouted, so I hope my second go round will do as well!